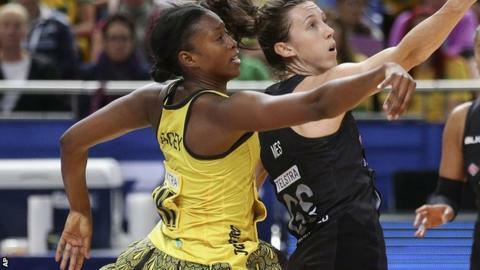 Jamaica kept alive their hopes of reaching the semi-finals of the Netball World Cup with a 59-47 win over Uganda. The victory was Jamaica's first in the qualifying round as the fourth-ranked team in the world moved level on points with Malawi. Their meeting on Friday will now decide which country advances to the last four behind Pool E leaders New Zealand. Scotland lost 48-42 to Fiji in Pool H, finishing second ahead of the play-off round to decide their final placing. Elsewhere Trinidad & Tobago beat Samoa 67-47 in Pool G, while Barbados beat Sri Lanka 67-33 in Pool H.
England and South Africa meet on Friday to see who will follow host nation Australia into the semi-finals from Pool F.